Knowledge Matters in Northampton could make history as a company that helped make the textbook obsolete in American schools. Indeed, the educational software outfit has changed the way many classrooms operate by introducing simulations that teach everything from profit margins to crowd control — and can actually enable users to rewrite history. In a small office suite in downtown Northampton, hundreds of Egyptians are harvesting grain in preparation for an impending flood. That’s not a metaphor for the latest team-building craze in corporate America, and it’s also not an uncommon occurrence at Knowledge Matters Inc. (KM), an educational software developer and publisher. Rather, those intrepid field workers are the subjects of KM’s latest project, which teaches the history of ancient Egypt by placing students — virtually speaking — on the banks of the Nile. KMI began developing computer-generated simulations (sims) for use as learning tools in 1997, after founder and CEO Peter Jordan, a software developer who previously worked with McGraw-Hill, the text and educational materials publisher, received a grant from the Federal Department of Education to further explore the feasibility of sims as educational models for classrooms across the nation. Essentially, sims create virtual environments that a user can manipulate to create an unlimited number of end results. The software gained some notoriety in the gaming world in the late 1990s, when computer programs such as ‘SimCity’ and ‘Roller Coaster Tycoon’ first hit the market, however KMI has long been focused on producing purely educational programs, with the goal of proving that a multi-media approach to learning could eventually replace, and not merely supplement, the textbook. “We’ve found that properly designed simulations are a ‘dominant’ technology in education,” said Jordan. “By that, we mean they surpass the main alternative (textbooks) on every important purchase criterion. They are easier to teach with, increase the amount learned, are more enjoyable for students, and actually cost less. KM’s first product, Virtual Business – Retailing, released in 1999, was created in response to a growing need for business-related, college preparatory products for high school students, and teaches basic business principles. It puts the student in the role of convenience store manager and maker of all the decisions that would be made in a real environment – from stocking to pricing; hiring to firing – that affect the store’s profitability. Since that time, the company has expanded the Virtual Business line to include programs centered on management and supervision and sports management (students manage a football franchise). The programs have been used by more than 500,000 students in 3,500 schools around the world, prompting a 50% increase in revenue for KMI last year. They are the subject of national competitions among teams of high school students across the country; students take the management of their virtual environments so seriously, Jordan said, they hold their coats open to shield their ‘trade secrets’ from other teams. It’s a precaution he can understand. 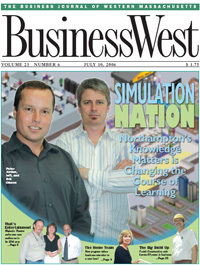 Although KMI has quietly grown to become one of the leading providers of educational software in the country from its small base in downtown Northampton, coupling virtual technology with the education sector – not known for strong or easily navigable funding streams – has been a challenge for the privately-held company and its core staff of six. That means being very selective about what is included in each program and what hits the cutting room floor, explained Eric Olsson, KM’s vice president, who joined the company shortly after Retailing entered the market. That, along with employing some trade secrets of their own and continually testing the sims within schools – including local high schools, middle schools, and community colleges – has resulted in a suite of computer programs that are steeped in the educational process and very light on frivolity. Simulated characters may get unruly at sports arenas, or shoplift, but each action eventually affects the bottom line, and very few actions are included for the sake of cool animation. With the goal of further capitalizing on what they firmly believe is the future of education, KMI is about to launch its newest sim line, called Virtual History, tailored to middle school social studies classrooms, with hopes of similar success. Slated to reach classrooms by September, KM’s first foray into virtual history will tackle the lessons and concepts of ancient Egypt, using the same villagers currently milling about at the KMI offices, baking bread and fending off violent Nubian tribes. Olsson said Virtual History – Ancient Egypt will be followed by programs centered on early settlements in America, ancient Greece, and westward expansion. Even with a three-fold increase in use anticipated for the business and history sims, however, Olsson, a former teacher himself, explained that the company’s products are part of a still-fledgling cultural change in the educational sector. Still, he said it’s a movement that is gaining momentum and pointing schools toward more interdisciplinary approaches to teaching and non-traditional teaching tools. He said schools are being pressed more often to offer lesson plans that touch on multiple disciplines simultaneously, and simulations are helping teachers create comprehensive lesson plans that are also engaging for students. “Teachers are being pushed through (the federal program) No Child Left Behind to create interdisciplinary lessons, and in some cases our sims are being used as the backbone of the curriculum,” Olsson said, noting that through the ancient Egypt sim, for instance, students in grades five through eight are charged with the task of managing a virtual village by applying knowledge of ancient Egyptian life and culture. Taught through a series of mini-tutorials within the sim (a student must pass a three-question quiz before moving on), these historical facts touch on economic variables, technological advances, and available resources, among others, and lead to specific benchmarks that must be achieved. Students must successfully farm and refine grain to make bread and consequently feed the village, for example, but must also avoid the destruction of crops and the loss of lives to the annual flood of the Nile. And in the final level of the sim, students can only successfully construct a pyramid after they have secured the necessary manpower, tools, and materials. That notion of ‘what if’ teaching models is one that is pervasive in all of KM’s products, and is also one that has shown promise as a teaching tool for students who have difficulty with more traditional teaching methods. “Sims have a very real leveling effect,” said Jordan, likening the work students put in to increase their convenience store’s profits or tame unruly fans at their arena to a game of golf. “It doesn’t matter how pretty you look getting the ball in the hole, as long as it goes in. It’s the same for these kids … it doesn’t matter how they increased their profits, it just matters that they did. This list includes those with attention deficit disorders, those who have become withdrawn from the school experience, and those with behavioral problems, among others. And as roles reverse, Jordan added, the role sims are playing in modern education is expanding. “Textbooks die hard,” he said, “but it does look pretty ominous for them in the long run. Today, simulations are still largely seen as ‘supplemental’ tools with the textbook as a core, but the trend is toward reversal. “Sims have proven to be much more engaging, especially when used by reluctant and emerging learners,” he continued. Indeed, hundreds of tiny Egyptians can’t be wrong.